Appearance: The lapwing (Vanellus vanellus) is a species of plover from Europe that migrates to northern Africa during the winter. It is quite common in the Nile Delta. It is easily recognized by its upturned crest, long legs and short hooked beak. In Egyptian art it was commonly depicted with its wings pinioned so that it can not fly. Meaning: Early in Egypt's history, the lapwing was a symbol of the people of Egypt under the king's rule. On the Scorpion Macehead (c. 3000 BC), the lapwing is a symbol of the rule of the Upper Egyptian king over the Lower Egyptian people. 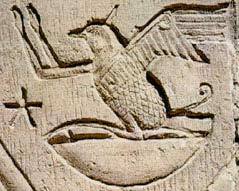 The bird was an obvious choice to represent the Lower Egyptian people due to its habit of wintering in the Delta. On a 3rd Dynasty statue of King Djoser, he is shown standing on the Nine Bows (the enemies of Egypt), and also on several lapwings. These lapwings are shown with their wings twisted so that they are helpless and unable to fly. In New Kingdom times, the bird's image was more positive. The image of the pinioned birds was transferred to the enemies of Egypt. However, it was still commonly a symbol of the people of Egypt. From the 18th Dynasty forward, the lapwing was often portrayed with human arms in the act of giving praise. The bird was often shown in this pose on a basket with a star. This image is a rebus of the statement, "All the people give praise."